Since I was first introduced to FlatOut thin crust Pizza breads last december, I’ve been using them like crazy. At least once a week, I make either some quick snack pizzas in the afternoon or for dinner to go with a big salad. It’s the easiest and least expensive way to enjoy crispy thin crust pizza at home. Usually, I make pretty simple pizzas with just cheese or salami and maybe some bell peppers, onions and olives. But today I wanted to make something a little more special, something with FLorida flare, shrimp and grilled! 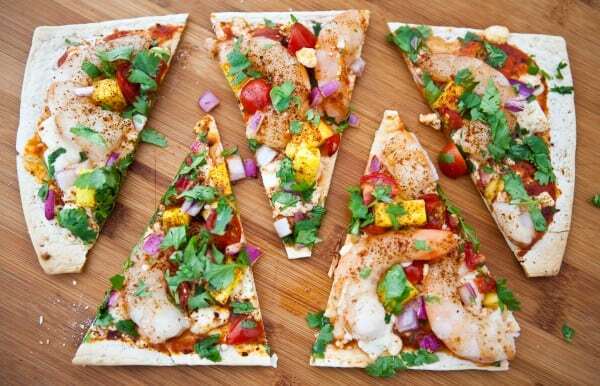 So I made these Floribbean style chipotle shrimp and mango Flatbread pizzas. Floribbean is the made up word (not by me) for fresh florida produce, usually seafood and fish combined with Caribbean and Deep southern foods and flavors. It’s our most used style of cooking. To start out, I just lightly spread some pizza sauce on my flatbread. 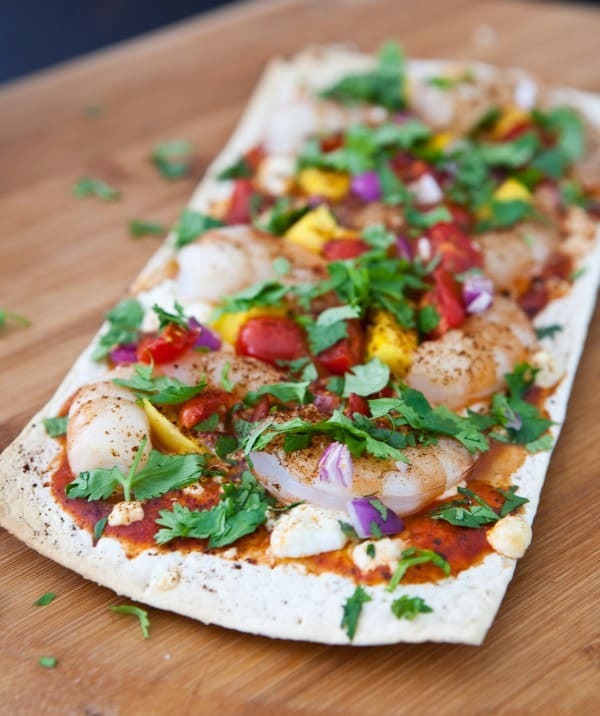 Then topped it with queso fresco crumbling cheese, large shrimp, mango, tomato and red onion. Then I grilled it over indirect heat at a temperature of 350° for 5 minutes or so. The amount of time to cook these will depend on the size of your shrimp. FlatOut recently sent me some of their new Thin Crust Flatbreads. You can find the new Flatout Thin Crust Flatbreads at Walmart. Follow this link to find a Walmart Near you that carries them! For more inspiration, check out the 30 Days of Grilled Pizza going on over on the FlatOut Facebook Page. It’s FlatOut Good! Heat grill to 350°. Use indirect heat by turning only one burner on a higher setting. Place the flatbread on the side of the grill where the burner is NOT turned on. 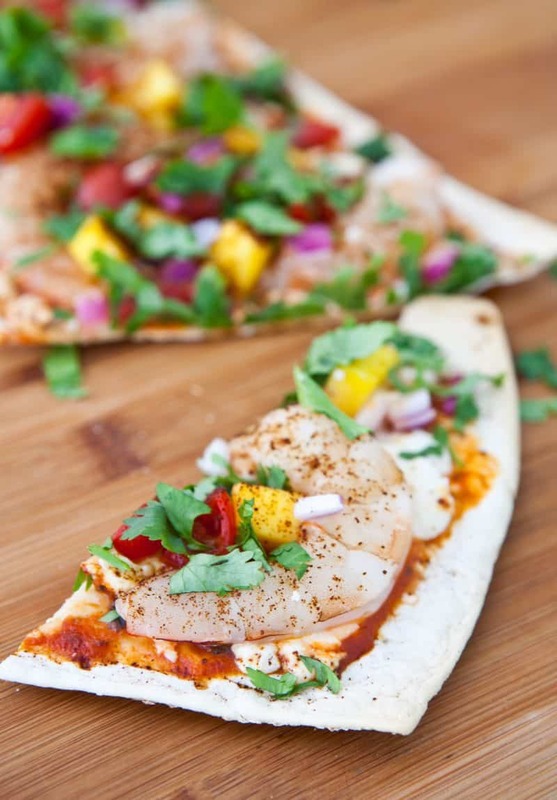 Top flatbread with pizza sauce, shrimp, queso fresco, mango, tomato, red onion, and sprinkle with chipotle chili powder. Grill with lid closed for 4 - 8 minutes, or until shrimp are cooked and pink, and cheese has melted. Top with freshly chopped cilantro before serving. For a chance to win a two night trip for 2 to Taste of Chicago Food Festival on July 10-14, 2013, just enter in the widget below! This post sponsored by FlatOut. All opinions 100% mine. Prize courtesy of FlatOut Bread. I must find some of those flat breads, my boys would love them! Looks yummy. I love chopped salads. I just saw a great one for a health salad. Cilantro, pepper, ginger, green onions with a maple syrup dressing. Shrimp and mango sounds so good. Love the colors in this, too! I just picked these up!! Haven’t made anything with them yet, but I can’t wait to try them out. I love flat outs! Your flatbreads look fantastic! Floribbean sounds like food I could easily eat alot of – love that shrimp and mango with chipotle combination! I need to keep my eye out for this flatbread, sounds like something I would use regularly, too. Yum! This looks amazing!!! I love the shrimp/mango combo!